The San Jose Tech Museum is looking for yucky leftover Halloween candy. It can be traded for a yummy NESTLÉ CRUNCH fun-size bar, and 10% off admission through November 8. The collected candy is being transformed into a rocket ship sculpture. What fun! 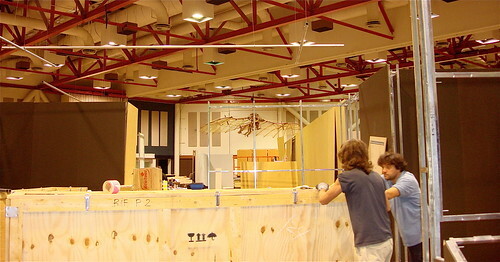 The stage for ‘Leonardo: 500 Years into the Future’ is being set at The Tech. Though there is not yet much to see, I was able to get into the mood as the team of workers would speak, and occasionally sing in their native Italian. Over 200 artifacts, drawings, working models, and paintings will be on display. Visitors to the exhibit should emerge with an awareness of the genius that was Leonardo. Anticipation for this exclusive U.S. showing is great, so I suggest purchasing tickets in advance.